Dr. Xiaohui Zha was listening to one of her students present at an international research conference in 2015 when she suddenly lost hearing in one ear, and then the other. Although she didn't know it at the time, blood was leaking into her brain from a burst blood vessel. She didn't want to disrupt the presentation, so she quietly walked out of the room before collapsing on the floor. 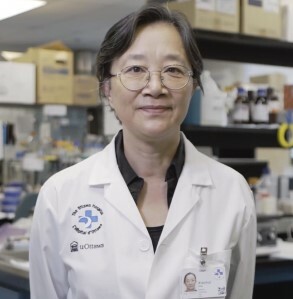 Dr. Zha, a senior scientist at The Ottawa Hospital and associate professor at the University of Ottawa, later learned that she had suffered a severe kind of stroke, caused by a brain aneurism. Many people don't survive this kind of stroke, and those who do often have major long-term disabilities. "I've never accepted defeat all my life, not easily." she said. "So I knew when I first woke up that I was going to make it, even though the only thing I could move was my eye." In the early days of her recovery, some people asked if she would retire early, but she refused to consider it. "Sickness is very depressing and recovery, when slow, is even more so," she said. "What pulls you up is the excitement, be it your work, your hobby, your dog or your kids. Luckily, I have always enormously enjoyed science and loved my work. This became my powerful crutch to recovery. " Dr. Zha gradually began to work from home and skyped into her lab daily, but it was more than a year before she could return full-time. When she did, her colleagues say it was "full speed ahead." In the short time since then, Dr. Zha and her team have published several groundbreaking studies in cholesterol research and two of her students successfully defended their Ph.D. theses. Her team's biggest discovery involved a protein called mTORC1. They found that this protein can trick our cells into making excess cholesterol and fat even when they don't need to. People with obesity and diabetes often have overactive mTORC1, so targeting this protein could lead to new treatments for these diseases and related cardiovascular conditions. This was judged to be the top research paper of more than 1,300 published in the last year by scientists at The Ottawa Hospital, netting Dr. Zha the coveted Chr�tien Researcher of the Year Award. Dr. Zha credits her success to her "loyal and dedicated" students and postdoctoral fellows, as well as her supportive colleagues. But her illness may have also provided some extra motivation. "I gained a new appreciation for life," she said. "I realized that if you want to make a difference in the world or in science, you need to do it today, because there might not be a tomorrow. I also got to see the impact of cutting edge research on my own treatment, and this has inspired me to work even harder."